You are here: Home » Does the ‘Back in Time’ iPad app give a glimpse of the future? Does the ‘Back in Time’ iPad app give a glimpse of the future? Back in Time is an app that really utilises the power of the iPad for delivering beautiful content in an easy to use format. It begins with the Big Bang and ends with the Human Genome Project. 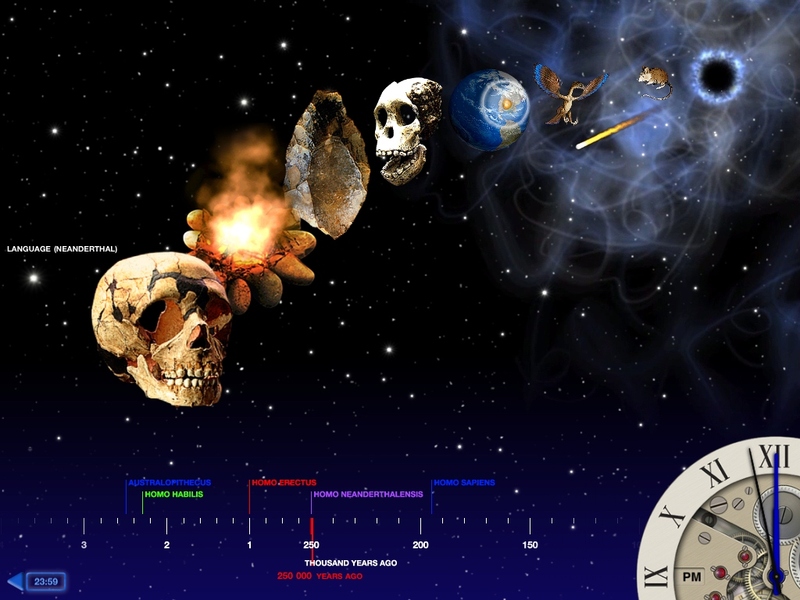 A timeline of major events from the beginning to now (whether the beginning was defined by a single event or has there there multiple ‘Big Bangs’ is a different thing and for another debate but this starts at our beginning). It’s visually stunning and beautiful to navigate through. The first night I got it I spent hours exploring it. I couldn’t put it down. The video below on YouTube from the makers gives a sample of just what it is like. The sequence you see of the app is exactly as it appears, dragonflies and insects included walking across the screen. The ability to slide so beautifully backwards and forwards through time either by the graphics or via the clock is fantastic. The mix of text, pictures and video is so very nicely put together. They have successfully been able to condense billions of years into a small app and allow us to understand and visualise just how small that portion of time for which man has existed. They have tried to break away from the book type feel that normally accompanies many such apps and this new format works so much better while still providing vast quantities of easily accessible content. When I was a child this was my World Encyclopedia, my Space Encyclopedia, books that I would spend hours reading and flipping through. This experience for my kids is so much richer, accessible and enjoyable. This app for me is the future of books in many ways. Imagine learning geography or history in school in this format as opposed to the traditional book. I don’t mean simply digitizing the current books and putting them on a iPad type device. I mean immersing yourself in a truly interactive app for example in a piece of history where you could read about it, hear it, watch it. A speech from Martin Luther King, pictures of the 1916 rising, a video of protests in Tiananmen Square or the walk to freedom of Nelson Mandela. How much better could we educate, excite and instill knowledge and curiosity into those young minds. How much better would it suit all types of kids and learning types and abilities. All that aside I said a glimpse in the title as I think it is only a glimpse as its not complete. I said ‘truly interactive’ in the paragraph above on what the app should be like. This app while excellent is not truly interactive . I want this app to interact with the outside world. And yes by that I mean the internet and not washing your dishes. I want to be able to enhance the experience and access to knowledge and material by easily incorporating the resources on the web. Yes I could close the app and simply Google the topic of interest or search for a video on YouTube but what if I could just click on a word in the app that gave me even further options? What if I could touch the word ‘civilization’ and it brought me to the page on Wikipedia. What if when I touched the word ‘Maya’ it auto built a Google search with that word, or it gave me options to go to the Maya National Geographic page, or Google Maps showing where the Mayan people lived. I look forward to when this app is truly interactive with it and the web. When I don’t understand a word its definition is only a touch away, a place named in the text is only a touch from viewing on Google maps and a topic I would like to learn more about can be explored simply by a touch! Am I asking for too much? I really hope not. ← An app that means I don’t hate Dublin Bus! Real-time bus times!